This clear, sparkling Sake features fun and delicate bubbles. The secret to these bubbles that burst in your mouth is "bottle conditioning". The additional fermentation within the bottle, naturally carbonates the Sake. Its fine, beautiful bubbles are expressed when poured into a glass. It has a fruity bouquet, elegant sweetness, and refreshing, bubbly mouthfeel. The light, crisp flavor can be enjoyed before a meal, and lends itself to Japanese or Western food, as well as dessert! **Be sure to serve chilled. When opened at higher temperatures, contents may spray out. 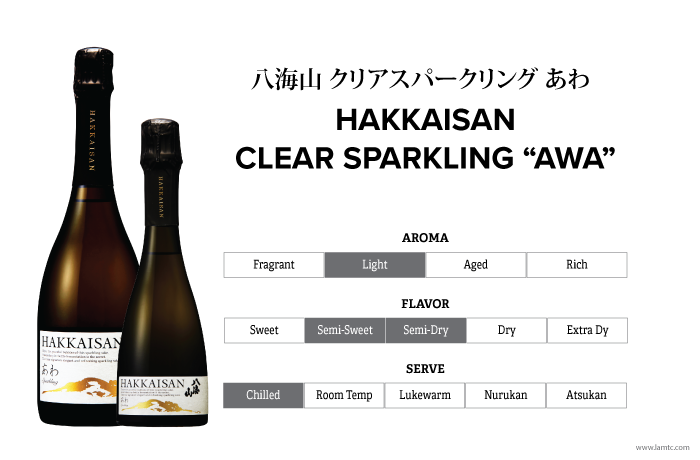 Brewery: Hakkaisan Brewery Co., Ltd.